Saw them! Absolutely incredible. 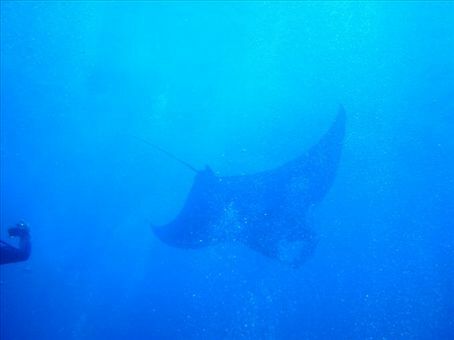 Being underwater in beautiful, warm, clear water and having these enormous, graceful rays swim right up to us - indescribable. I know James will say more, but all the rockiness on the boat, 5 days and 4 nights not setting foot on dry land, having salt encrusted hair and a noisy generator chugging away all night was totally worth it, just for that one supreme dive. The Similan and Surin Islands are gorgeous (think white sand, azure beaches, lush forest) and under the water is even better. We spent all day eating and diving. Seriously. At least 4 hours underwater every day, and the rest of the time was eating (as it took so much energy), gearing up, swimming to the sites or back again. So that was our very generous first wedding anniversary present to each other - a nitrox course. How romantic are we.